Actor, Writer and Director. Trained at the Royal Welsh College of Music & Drama. An expert in dialects, improvisation and stagecraft, Christopher wrote the hit musical 'Oh, What a Night'. He also worked as a Management Consultant for Charles Street Communications and with the organisation tasked with obtaining the parliamentary powers for the Jubilee Line Extension. The higher up the corporate ladder you are, the more you have to give presentations; to colleagues, conferences or the press and doing it well, is not as easy as it may appear. The whole focus of 21st Century Presentation Skills is to bring out the inherent flair and personality of the speaker. When an audience engages with the person, he or she can deliver any message. Developing the power, pitch and tone of the voice. Learning projection techniques, and working on resonance, pace and articulation. Learning the various techniques that actors use when speaking to a large group of people, whilst keeping the delivery personal and intimate. How to make the speech seem spontaneous and unrehearsed. Body language is non-verbal communication and forms 50% of how what we’re trying to communicate is understood by the listener. The words we use only make up 10%, whilst the other 40% derives from the tone of voice and inflection. We’re all brought up to believe that listening is a virtue but now you can see just what a complex and active process this is. This also explains how someone with awkward body language and a monotonous voice will lose the audience’s attention very quickly – no matter how hi-tech and impressive the accompanying PowerPoint graphics may be. This section will also cover Posture, Gesture and Dress. How to cope with the anxiety that naturally comes with addressing an audience, so that you appear calm, confident and in command. How to construct your speech; the use of visual aids or technology; and bringing together all the best elements, to lift the speech off the page and deliver a professional, informative and dynamic presentation. In a global economy, many companies employ key personnel from all over the world; people for whom English is not their first language. It’s important for their self-esteem and to fulfil their role within the business that these people can speak English clearly and with confidence. In addition to the skills outlined above, specific modules have been developed to improve the clarity of spoken English by working on the mechanics of speech and diction and applying them to a particular accent. It’s ironic that the higher up the career ladder you climb, the less you’re required to use the core skills that won you those promotions in the first place. Suddenly, you’re expected to be a strategist, a team leader, a public speaker, a mediator, to liaise with other departments; in other words, to shift the focus of your role towards communicating internally, with colleagues and externally with the outside world and the marketplace. How on earth are you expected to do all that? So, 21st Century Presentation Skills is for high flying executives with aspirations to step into a greater arena. Course structure and costing will be determined by the clients’ specific needs which will be arrived at through an initial consultation. Everybody has their strengths and weaknesses, so the first session starts with an assessment of what they might be. This process falls into two parts: self-assessment – which involves talking to the person to ascertain where they believe their virtues and vices are: and, objectively by getting them to prepare a 5-minute presentation on a given subject. This presentation will be filmed and analysed with the client. This process will enable us to prioritise which areas will need the greatest work, voice, body-language, confidence, etc. Fundamental to the success of this programme is the amount of practice that each client puts into the training. With this in mind, we require regular smart phone videos of them practicing as means of verifying that they are putting in the required hours. Dedication is the key. Depending what comes to light in the first session, we will focus in-depth on the deficiencies. We are all judged by the way we walk into a room, how we sit in a chair, the eye-contact we give, the pitch, tone and inflection of our voice; yes, judgement, long before listening to what we actually have to say. So, this is where we deal with the fundamentals of posture; the mechanics of speech and diction; in fact, whatever is required to bring out the flair and personality of the client. As part of this process we will use the presentation from Module 1 to develop some of the essential skills and work on those inter-personal situations that the client finds most difficult. Data is important but it is vital not to overload a presentation with so much data that your audience find it difficult to sit through let alone retain any of the salient points. This module deals with how to construct your presentation; what information to put it in, what to leave out and what to make available in other formats after the presentation. It also deals with performance skills and techniques that enable someone to capture and maintain the attention of their audience. The final module is where we bring together all the lessons learnt in the previous modules along with new exercises to reinforce the new habits. Here again it will be necessary for the client to produce a short presentation on a given subject so that it will be possible to compare and contrast between where they started and where they are now. We are bespoke and not corporate. Most training programmes offer separate modules for the various aspects of effective communication but the fundamental approach is a ‘…one size fits all’. 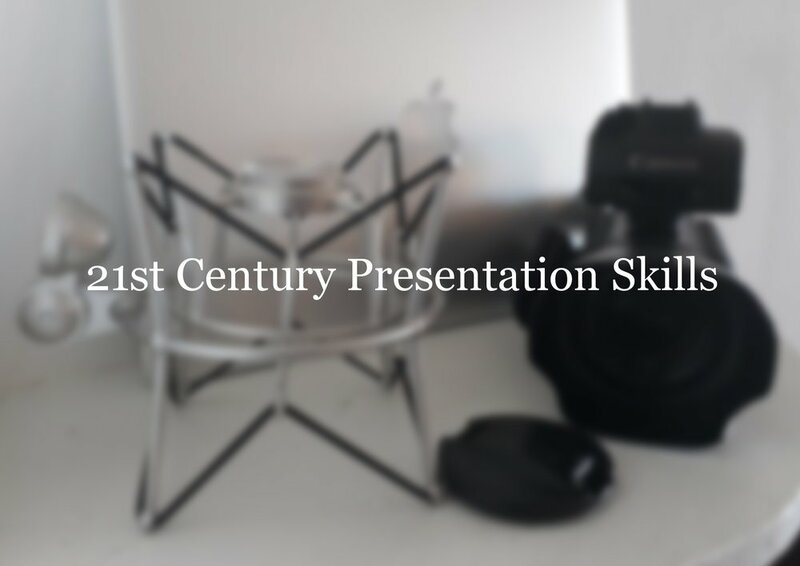 21st Century Presentation Skills takes a 360-degree approach and looks at the person in the round. We also have two key advantages; Christopher’s expertise in improvisation and the dynamics of personal power, and Susie’s 30 years’ experience as a Life Coach which enables us to help people make the emotional and psychological transition from taking orders to giving them.